Jairo Reyes is shown talking to UPS workers in video of a UPS strike. UPS recently fired 250 Queens, N.Y., employees for staging a 90-minute strike in February to protest the dismissal of one of their co-workers, Jairo Reyes. The story has been widely reported, but little has been said about why Reyes — a 49-year-old longtime employee of UPS and a union activist — was fired in the first place. We spoke to UPS and Reyes to get their sides of the story. UPS said it dismissed Reyes on Feb. 14 because he repeatedly clocked in earlier than his shift was set to start, which resulted in his being paid overtime for hours that he allegedly didn’t work. “There was a disagreement over the hours he clocked and the hours he actually worked, and we discharged him after several warnings,” UPS spokesman Steve Gaut told Business Insider. But Reyes said he had a manager’s approval to clock in early, beginning around Jan. 6. That same manager later denied giving approval for the new schedule, and Reyes was subsequently fired, he told Business Insider in an interview. Reyes has alleged that the manager was retaliating against him for signing a grievance in early February about senior workers’ hours. Reyes said he was never given a warning before he was fired. According to the union, Teamsters Local 804, the firing violated an “innocent until proven guilty” clause that allows terminated employees to continue working until they have had an opportunity to defend themselves in a hearing with union and UPS officials. That hearing was eventually held on Feb. 26 at the Maspeth distribution facility where Reyes worked, and his termination was upheld. Immediately following the meeting, Reyes walked out of the facility with about 250 workers in tow. Alleged video of the walkout shows Reyes standing in a circle of UPS workers outside the facility and giving an impassioned speech against UPS. 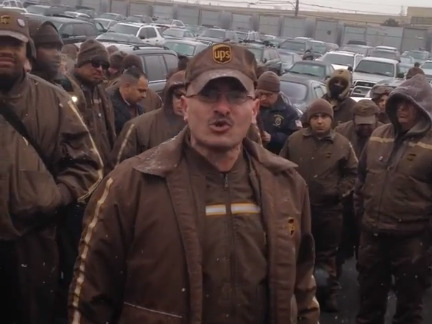 Toward the end of the video, an unidentified man explains that he’s spoken to UPS and union officials, and orders all the workers to return to their jobs. The strike lasted 90 minutes. UPS employs 1,400 workers at the Maspeth distribution center. The company is firing 250 employees who took part in the walkout. The company maintains that the 250 firings are totally unrelated to Reyes’ dismissal. Strikes are not an approved method of conflict resolution in UPS’ contract with the union, so the company has the right to fire employees engaging in a walkout, Gaut said. But UPS customers say the company owes them something else. The customers wants UPS to keep the drivers that have served them for years. Fired Local 804 drivers have launched an outreach campaign to talk to customers about what UPS is doing to drivers and their families. The response has been overwhelming. More than 3,000 calls have been logged to UPS CEO Scott Davis. Customers are posting messages on the company’s Facebook and Twitter accounts. They’re also taking photos with their drivers to show their support. Fired drivers Jairo Reyes and Domenick Dedomenico spoke out on MSNBC’s number one rated daytime program. As America hears our story, the calls from the public grow louder for UPS to stop the firings and rehire all fired workers in Maspeth. Over 90% of respondents to MSNBC’s Gut Check poll say UPS should rehire the 250 drivers.